Before it even starts, we know how A Mighty Heart must end. Why, then, watch it at all? The movie is based on the kidnapping and murder of Wall Street Journal reporter Daniel Pearl (played by Dan Futterman, a near-perfect match), abducted in Pakistan in 2002 while researching a story on the terrorist connections of the so-called shoe bomber, Richard Reid, beheaded in a film that was shown around the world. Angelina Jolie plays Pearl's wife Marianne, herself a journalist; the actress' skin has been darkened to reflect the real woman's Afro-Cuban descent, her French accent a little too perfect. When Daniel disappears while interviewing a suspicious source, Marianne, five months pregnant, does not fall apart, but helps the Pakistani and American agents track down the kidnappers. The story unfolds like a police procedural. We don't see what happened to Daniel after he was taken. Instead we follow Marianne and her interactions with the sometimes indifferent foreign bureaucracy, the local counter-terrorism official (Irrfan Khan), the American special agent (Will Patton), Daniel's editor (Denis O'Hare). Jolie is at center stage, and though she gives one of her best performances, her presence, her transformation, is a constant distraction, which points to a larger problem with the film�it tells its story well enough, but it feels like the wrong story. Director Michael Winterbottom, whose only signature style is that he has none, directs like he's making a documentary, employing hand-held digital photography and fragmented editing to tell the story in as unglamorous a fashion as possible. There are only a few "movie moments": flashbacks to the Pearls' happier times that offer a welcome respite in the darkest moments; Marianne's pained outburst after she discovers her husband's fate. Curiously, the matter-of-fact storytelling is somewhat distancing. One scene after another follows the police and special investigators as they follow one lead after another, but we never get a feel for who any of them are. Relationships�such as the friendship between Marianne and her Indian friend Asra (Archie Panjabi)�are never really established, not to mention developed. The movie is good about not telling us what to feel, but neither does it make us feel much of anything. And that's the real problem. As well intentioned as it is, A Mighty Heart tells the wrong story. The search for the missing reporter is the stuff of screenplays�characters pace in frustration, a whiteboard fills up with a labyrinth of indecipherable connections between possible suspects, Angelina Jolie is filled with a furious resolve�but it isn't the story we want to see. Daniel Pearl is the story. What he did, and why he did it. Marianne's story is undeniably a very human one, potentially very powerful�but by focusing on her too much, the movie feels reduced, an actor's showcase. Though we're told it's so, we don't see why the Pearls believe journalists play such a vital role in the world. We're only given bits and pieces of the story Daniel was investigating, and only the barest hint of its larger context. Most people probably don't really know what it means that Daniel was abducted while in Pakistan; if it had been Iraq, Iran, or Saudi Arabia, it wouldn't make a bit of difference to the film, which is more about the search, a process we've all seen done before and in far more cinematic a fashion. The movie coasts on the fact that we all know this is a very sad, and unfortunately very real story. But it never takes us inside it, never tells us why this story matters�it fails to connect. For such a gut-wrenching account, it's an oddly arm's-length film, engaging the head far more than the heart. Image Transfer Review: The 2.35:1 widescreen 1080p presentation appears to be the same transfer used for the HD-DVD release. Cinematographer Marcel Zyskind gives the exterior footage a natural, documentary feel that only adds to the emotional impact of this true story. A natural color palette is also in use, and unintentional dirt and grain are nonexistent. Audio Transfer Review: The Dolby TrueHD track also seems to be the same one from the HD-DVD. This is a dialogue-driven film, though, so the audio mix isn�t going to knock your socks off. Still, the lossless track is full of depth and nice directional effects that are generally reserved for the exterior sequences. Extras Review: All of the extras are in standard definition, and are identical to those on the HD-DVD, with the addition of the film�s original HD theatrical trailer. 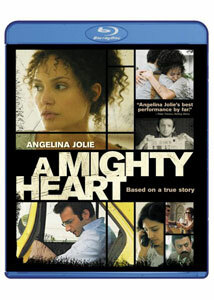 A Journey of Passion: The Making of A Mighty Heart is a 30-minute look at the production. In separate segments for each character, the actors discuss the real people they portray, offering their feelings on acting as people who were involved in a very real tragedy. Director Michael Winterbottom discusses his somewhat improvisational shooting style and the development of the screenplay. The discussion is interesting, but strives more for insight than behind-the-scenes material. An eight-minute featurette provides a bit of background on the Committee to Protect Journalists, while Christiane Amanpour shouts a public service announcement for the Daniel Pearl foundation, which seeks to promote understanding and tolerance across cultural divides through music, art, and journalism. A "feel bad" movie of the first degree, A Mighty Heart wallows in tension and, ultimately, tragedy, but doesn't offer much in the way of transcendence. The performances are good and the direction has a sense of verisimilitude, but the movie isn't very insightful, or even all that interesting. It has some weight, but only because we know it's based on a true story�it's never as devastating or illuminating as it should be. Sometimes "just the facts" aren't enough. The Blu-ray transfer is virtually identical to the HD-DVD release, in that it makes the source material look as good as it reasonably can. It just isn't something you�ll want use to show off your home theater.